Theodore (Ted) Sarantos, lifelong resident of Lowell, passed away at his home on Friday, Sept 7, 2018 at the age of 96, while in the loving care of his family. Ted was the beloved husband of Constance (Tina) (Pouleas) Sarantos who predeceased him by 10 years. 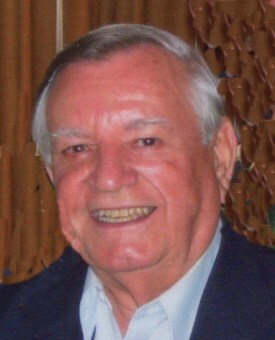 Born in Lowell on July 7, 1922 to the late Peter and the late Mary (Gickas) Sarantos, he graduated from Lowell High School in 1940 and immediately enlisted in the U.S. Army Air Corps and commenced training. Ted joined MIT Lincoln Laboratory in 1951 as an electrical engineer working on communication satellites for 39 years, retiring in 1990. He was called out of retirement multiple times. He was on the team that was able to provide the scientists and crew members of the vessel USCGC POLAR SEA with very valuable Internet e-mail service throughout the first surface expedition to the North Pole, as well as to send the commands to turn off one of his earlier satellites. After retirement Ted and Tina spent winters in Tarpon Springs, FL. He was a member of the Transfiguration Greek Orthodox Church, the AHEPA, and the Greek-American Legion. Family was first to Ted. He was a dedicated father to his three daughters, Maria and husband Andrew Kowal of Stonington, CT, Pamela Sarantos of Melissa, TX, and Elaine and husband Robert Masse of Dracut, MA. He was a devoted grandfather to his grandsons, Donald LeRiche and wife Julie of Liberty Hill, TX, Zachary Kowal and wife Dorothy of Petaluma, CA, and Theodore Masse of Brighton, MA, and to four great-granddaughters, Megan and Sydney LeRiche, and Farrah and Georgia Kowal. He was happiest when surrounded by his family, helping with household projects and vacationing together. He was always counted on for his lamb shish ka-bobs for family cook-outs. Ted was a loving and doting “Papou.” He proudly attended all graduations and numerous grandsons’ baseball and soccer games. Memorable grandson trips included Washington, DC and baseball in Cooperstown, Boston and Toronto. The eldest son of eight siblings, he is survived by his brothers Charles and George, and sisters Despina Dinopoulos, Elizabeth Lemondes, and Nora Vlahakis, as well as several nieces and nephews. He was pre-deceased by his brother Fr. John Sarantos, pastor at Lowell’s Transfiguration Greek Orthodox Church, and his sister Christine Economou. www.odonnellfuneralhome.com. Those wishing may make contributions in his memory to the Transfiguration Greek Orthodox Church, 25 Father John Sarantos Way, Lowell, MA 01854, or online at transchurch.churchgiving.com or to the Boys and Girls Club of Lowell, 657 Middlesex St., Lowell, MA 01851. Arrangements by Funeral Director James F. O’Donnell, Jr. (978) – 458-8768.